Our Cordless Express cell shades offer quick production so you get your custom cell shades in just days! Clean look without dangling cords that is pet and child safe. Made with blackout spun lace honeycomb fabric that blocks unwanted light as well as insulate your windows for energy savings. Can outside look through inside once the light is on, and outside is dark? With the cordless express 3/4" blackout single cell shades, you will have total privacy and you can not see out nor can people see in from the exterior. The quality is great. Installing it was easier than I thought it would be. The biggest worry was measuring correctly. It is in the sunny window, and it not only blocks 99% of the light(it's inside the window, not outside), it keeps the room cool as well. Definitely will buy more once I figure out the details. These were amazing and really keep light out. These were amazing and really keep light out. They were easy to install and look clean and neat. 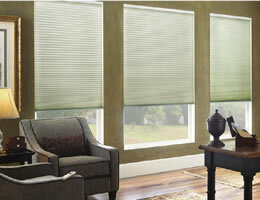 Really love these cordless blinds. The blinds are all just what I expected. The blinds are all just what I expected. Thank you. They were very easy to install and even easier to operate. Service was excellent - product was manufactured and delivered promptly and exactly to the dimensions requested.